Every hair lover must have heard about ARGAN OIL. 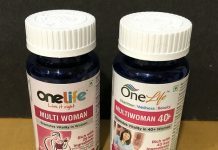 Recently, I got in contact with a company dealing with Argan Oil products, and being a fashion and health blogger, How could I leave the opportunity of reviewing hair products using Argan Oil. It took around a month or so, for the samples to reach me. 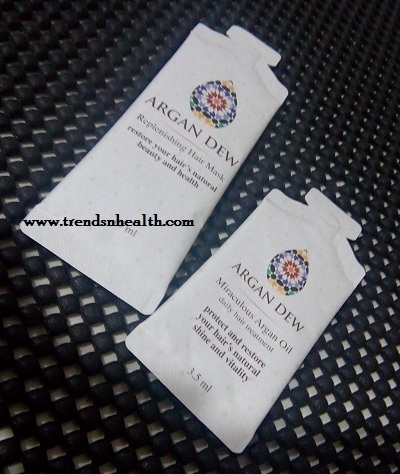 I was really excited about the samples of the Argan Dew Replenishing Hair Mask and the Argan Dew Miraculous Argan Oil. The tiny samples of both came attached to cute little cards. 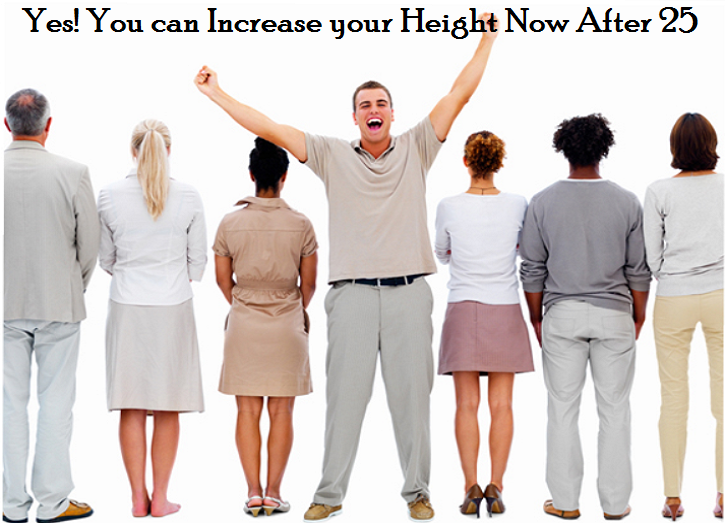 The cards explained the benefits of the relative product containing. 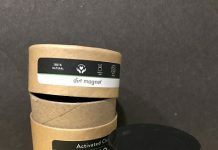 Argan Dew sent me 2 samples of 2 of their Hair products directly from Israel, so here is the Argan Dew Replenishing Mask and Miraculous Argan Oil Review. I have these really long hair (till my lower back) and weirdo type of hair, but trust me, taking care of them is damn tough. My scalp and hair roots are really oily and on the other hand, the length and ends are damn dry and frizzy. I use shampoo specially meant for oily hairs that makes my hair ends more frizzy and rough. But, to avoid frizzy ends, I use a nourishing conditioner. So, for Argan Dew products to work on my weird types of oily and dry hairs, was a real test (wink wink). Argan Dew Replenishing Hair Mask is made using the Moroccan Argan oil. Moraccan Argan Oil is well known for its rare quality of restoring and boosting the health of your hair. 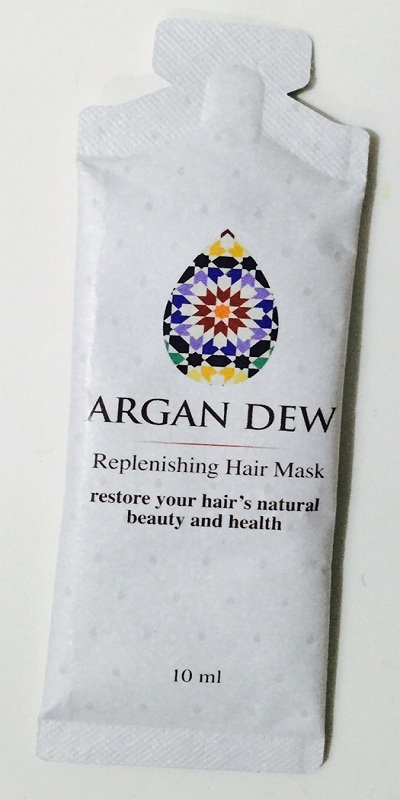 Argan Dew Intensive Replenishing Hair Mask is not tested on animals and is SLS/SLES free. 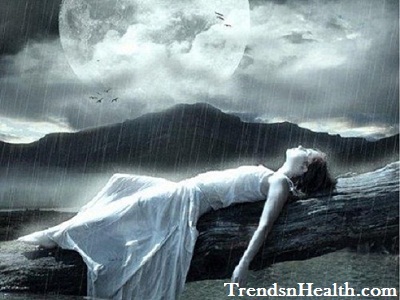 Water Glycerine, cetylalcohol, water & amodimethicone & trideceth-12 & cetrimonium chloride & glycerine, cetyl esters, behentrimonium chloride, argania spinosa kernel oil, cocamide mea, fragrance, dimethicone, imidazolidinylurea, propylparaben, methylparaben, SLS/SLES Free. P.S- I wish it was Paraben and Alcohol free. Pour into hand and massage into wet hair. Leave for 5 minutes and rinse. Argan Dew Miraculous Argan Oil is an exceptionally rich formula, it acts as a daily double action treatment for all hair types by protecting and rehydrating dry, dull and damaged hair from root to tip, repairing and nourishing each strand. 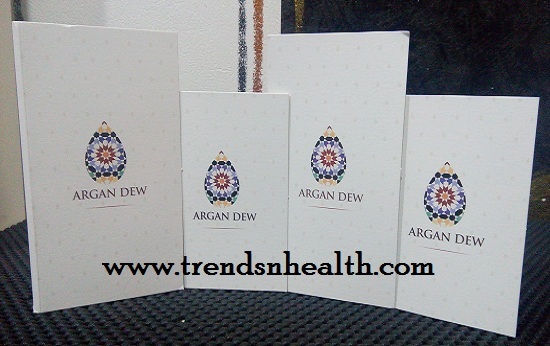 Argan Dew Oil is not tested on animals and is SLS/SLES, paraben and alcohol free. 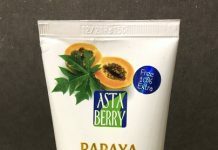 Dimethico, cyciopentasiloxane, cyclomethicone, argania spinosa kernel oil, ginkgo, biloba, hippophae rhamnoides oil, kawa (piper methysticum) extract, rosemary leaf extract, fragrance, SLS/SLES Paraben and Alcohol Free. Pour into palm of your hand and massage into damp hair. No need to rinse off. 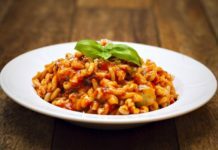 Avoid in contact with eyes and mouth. 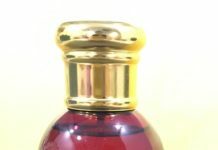 After using relplenishing mask, I was so eager to use the Argan Dew miraculous Argan oil but as I had already used the Mask I waited for a week to get the real results of the oil. After a week, I used the Miraculous Argan Oil after washing my hair. I used the oil on my damp hair. I made sure that I distribute the oil evenly in all of my hairs. I was a little worried, as the company says, you need not to rinse the oil off. Keeping oil in my hair…. Ooh!! Even the thought of it can be scary for any girl. Oil based products can make your hair slippery, greasy and oily. 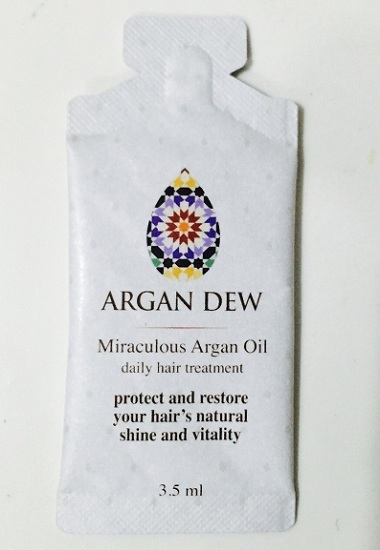 But to my surprise, Argan oil is not sticky at all, after I blow dried my hair, I was surprised, shocked and madly in love with this amazing brand – ARGAN DEW. My hair felt lovely, soft, a lot more shinier and so manageable yet not sticky at all. Apart from making my hair much more lively, the fragrance this oil has is something you will fall in love with. A piece of advice- Do try it when you going on date, or having some special time with your loved one. My hubby fell in love with the beautiful fragrance of my hair after I used Argan Dew Miraculous Argan Oil. The fresh and sweet magical fragrance from my hair made my entire day.